I saw a tweet yesterday evening from @sportingintel which utilised the fantastic Cann Table method of visually separating teams in the league table by the number of points won. This provoked me to unearth and complete one of my many half-finished projects, which takes this a step further to correct for teams having played different numbers of games by using ‘points per game’ rather than just ‘points’. To give you an example, Walsall are 9th in the current League 1 table but this is in part due to them having played 31 matches while other teams have played as few as 27. In terms of points won per match they’re actually 15th, so as others’ games in hand get played they’re likely to sink a few places. Stevenage currently sit 15th but have 4 games in hand and only 4 points fewer. 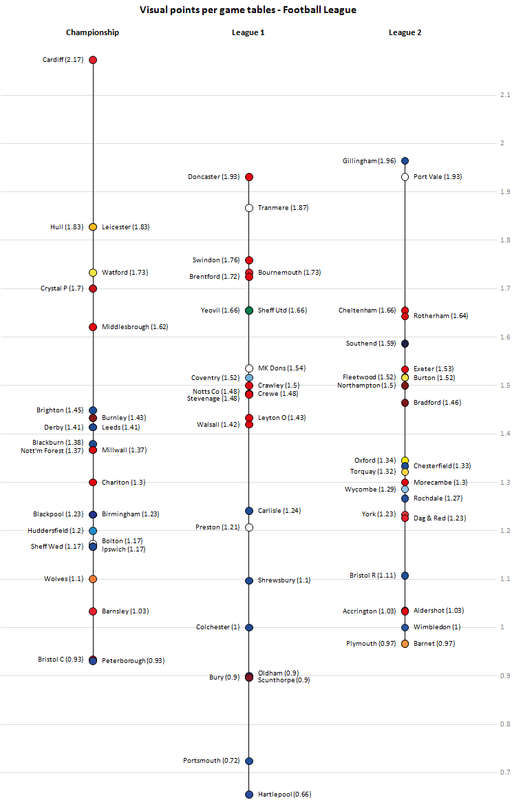 Hopefully the graphic below is self-explanatory – there’s a line for each of the 3 divisions which extends from the highest to lowest points per game totals for each, and every team is a dot on the line. Team names appear on alternate sides of the line to avoid crowding, with their current points per game alongside them in brackets. I’ve included a scale for easy comparison across divisions. As usual you can click the image to bring up a full-size version in a separate tab and there are a few illustrative observations underneath. You can see that Cardiff‘s dominance of the Championship is significantly more impressive than that of the top teams in the other two divisions, with the chasing pack of 5 teams spread out behind them. The plight of Portsmouth and Hartlepool in League 1 is clear here, although the teams directly above them should be concerned that their performances would see them rock bottom in either of the other divisions. While they may not have racked up such an impressive points per game total as Cardiff, the top two of Gillingham and Port Vale in League 2 are still dominating their rivals to a similar extent. Sorry there’s some scrolling involved, but this was necessary to spread the teams out enough for it not to be an unreadable mess! This is only a prototype version, so feedback is encouraged. EDIT – Now includes colour! Good idea…, probably will pinch it (adding colour, etc..) for some other classification. If you do, then please can you include an attribution back to me? Many thanks! Hi is there an online version for L2 which is up to date? Also it would be interesting (I think) to have a date slider so that you could see how the Cann table moves through the season. Just tweeted one out: https://twitter.com/experimental361/status/394847601255657473 – will definitely be looking at an interactive version this season. I tried my own version of the traditional Cann table rather than Points Per Game as I found it easier to compare with the actual table. I looked at L2 this season and last season after just 14 games. It was interesting to me to note that Gillingham and Port Vale were well clear and went onto be promoted, Barnet were rooted to the bottom and went down. Whereas this year it is a lot tighter.